The newly launched turtle workshop is the brainchild of the EAWST founder Volker Bassen. It is well-known that countless turtles get caught in fishermen’s large mesh nylon drift nets and meet their death by drowning. As well as turtles, a host of other marine creatures meet a similar fate. These nets can be several hundreds of metres long and can cause decades of severe damage to the aquatic ecosystem. It is important to note at outset that these nets have been used for years by fishermen along the Kenya coast. One net costs at least Ksh 50,000. The disadvantage of using these nets is that the fishermen can only use them at night and moreover when there is no moon. Furthermore, because they set the nets in the evening and collect them in the early morning, any fish caught in the early evening will not be fresh by the time it gets to the end-buyer. Many hotels reject the fish resulting in a loss of income to the fishermen who end up drying the fish and eating it themselves. In turn this causes the fishermen and their families all manner of health problems. To compound the situation, these nets will frequently become detached from their marker buoys and the fisherman will then have lost his most essential piece of equipment. Meanwhile the net itself becomes a “ghost net”, one of the most destructive weapons to be let loose on our fragile coral reefs. These ghost nets continue to fish for several decades. They catch turtles and whale sharks as they drift with the current. These creatures sink to the bottom with the net and there the net trawls the reef for lobster and fish, damaging the coral in the process. As the fish rot, they bloat and the net floats to the surface where the whole destructive process repeats itself again and again. These drift nets are the single most serious threat to Kenya’s whale shark and turtle population. 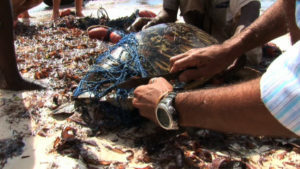 As a result of this, the EAWST has launched the turtle project. It has set up a work shop with fishermen making fibre-glass turtle shell lamps. These are beautifully crafted and look enchanting on the wall. They are sold in gift-shops and hotels. With the proceeds, the EAWST buys the nets from the fishermen. The fishermen are then taught how to fish using more environmentally friendly fishing methods, specifically using bottom long-lines. This method of fishing is carried out in much deeper water and targets different deep water species. This way the coral reef is left untouched, meaning that the juveniles can grow and continue to have a productive life cycle. The fishermen can fish throughout the month and the fish is much fresher when it reaches the consumer. Working hand in hand with the local fisherman, encouraging them to report whale shark sightings, produce whale shark carvings and other curios to illustrate the widespread benefits of conservation. Monitoring, tagging and satellite tracking working in tandem with Universeum and Chalmers University in Sweden and Hubbs Seaworld Research Institute in the US among others to create a wider knowledge data base on the whale shark. Remarkably little is known about the biggest fish in the ocean. It is unknown where whale sharks go to breed or whether global populations are related.Their migration patterns remain a mystery. Thanks to www.air-adventures.fr for all their help. The billfish foundation tag billfish with similar tags and do good work tagging and releasing. Accredited workshops and presentations on the whale shark, including field trips for local schools and for visitors/tourists. Scheduling 1 – 3 month programmes at a cost of $750 per month. Weekly costs are also available. Whale shark season runs from Oct – March, peak being Feb – March. In the off season, focus is on research, education and community projects. Activities such as safaris and mountain climbing are available and encouraged during days off. Prerequisites It will be helpful but not essential if you have a marine science background, have a diving licence, have a driving licence and are happy in the water! Accomodation The EAWST accommodation centre is located in the middle of Diani beach, 2 mins walk from shops, internet cafes and restaurants. The double rooms are simple and comfortable with a communal washroom facility and kitchen. Bedding is provided. The centre is on the beach and a short drive to our research base at Aqualand Watersports Centre. Diani beach also has a Post Office and 2 good hospitals. Travel to the Trust You will need a connection to Moi International Airport Mombasa, usually from Nairobi but there are now more direct flights to Mombasa. At the airport you will be met by a Trust representative and driven to Diani beach, approximately a 2 hour drive. Visas Most visitors to Kenya require a tourist visa. Please check with your travel agent. We recommend that you obtain your visa before traveling to ease your arrival although you can get the visa at the airport when you land. Medical Considerations Vaccinations recommended include Polio, Typhoid, Tetanus, Yellow Fever, Meningitis and Hepatitis A and Hepatitis B. Please note proof of yellow fever vaccination may be needed to enter the country. Please check with your local Kenyan embassy for yellow fever requirements. Volunteers should seek medical advice from their doctor regarding inoculations. Rabies is not needed however in case of an animal bite the injection can be given at the local hospital. We recommend that you travel with a basic first aid kit although the centre is fully equipped. Please note that we will require proof of medical/travel insurance upon arrival. The coast is a malaria zone so please come with anti-malaria drugs and insect repellant. Mosquito nets are provided. What to bring It can get very hot and humid, as well as very wet, so you should bring appropriate clothing (rain proof gear and bags) if you will be here during the rainy season (May/June). Light clothing is advised – shorts, shirts and durable sandals/flip flops. Please note that due to local traditional cultures, women are asked not to wear short shorts or revealing tops on work days. Mobile phones can be used here, please check the local service providers (www.safaricom.co.ke or www.zainlco.ke). If your mobile phone doesn’t have a SIM lock, purchasing a pre-paid SIM card while here and using it in your phone (far cheaper) is quite easy. Laptops are useful as computer time is limited. We can lock up computers each evening, but this is not a guarantee of safety.